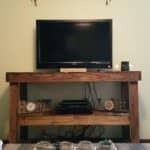 I recently built a pallet wood bookcase and decided to build a matching Rustic Pallet Wood Entertainment Center that measures 62"X 52"X 15" deep. I made shelves for CDs/DVDs on one side and designed it so that they can be accessed from the front or right side. 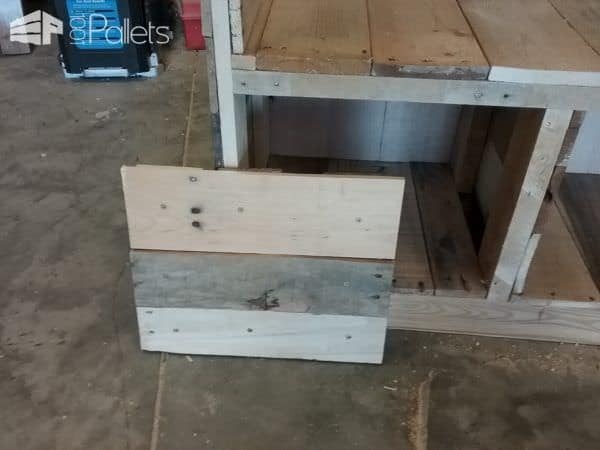 I made three storage compartments across the bottom and built pallet wood doors for two of them. Next, I drilled holes near the rear of the main shelf to route the cables from the bottom compartment to the TV. 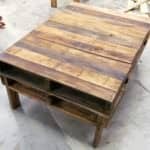 I wanted to use as much recycled pallet wood as possible but did use four 1 x 4"s for the four main vertical legs/supports. Additionally, I used store-bought 2 x 4" boards for the top back horizontal frame support. 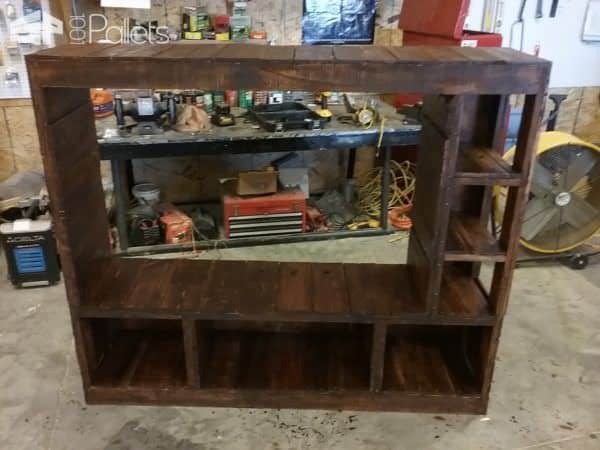 Creative upcycling can have you building your own Pallet Wood Entertainment Center for less than 50 dollars! 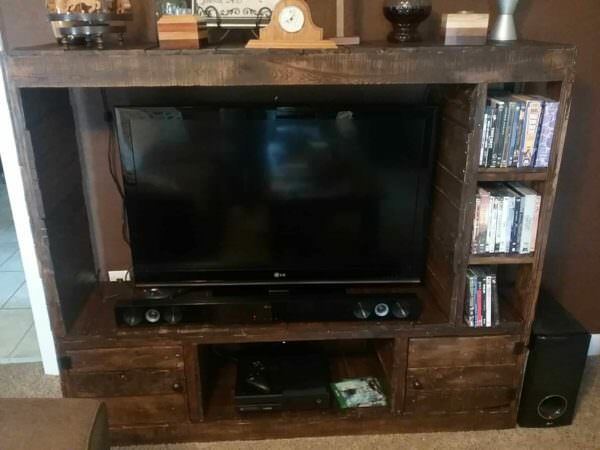 The section of the entertainment center that has a back is 3/8" thick quarter-sawn oak that I was able to salvage from the cabinet factory I work at. (That's also where I get all of my free pallets). 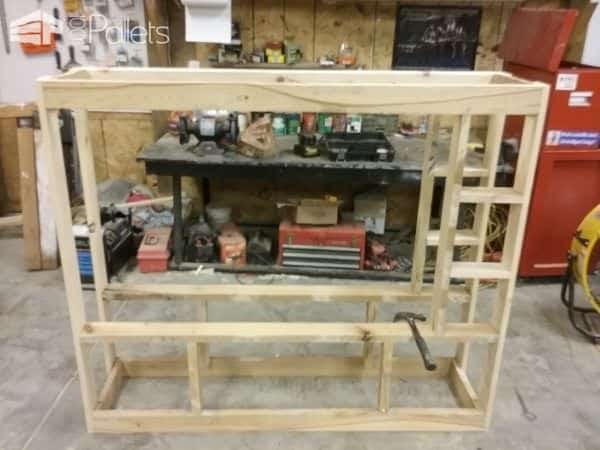 I used 2" and 2 1/2" wood screws to build the frame and then used wood glue and 1 1/4" trim nails to attach all of the pallet deck boards/slats. 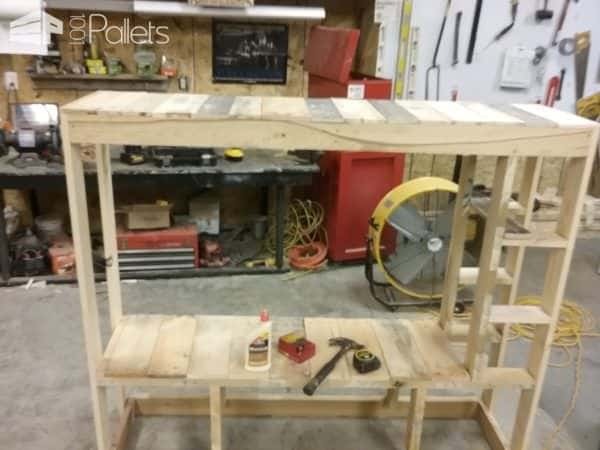 I built the doors from pallet deck boards while using wood glue and shorter screws to construct them. After sanding everything, I stained it with dark walnut stain and then applied one coat of satin polyurethane. I thought it turned out well and my wife really likes it, so that is what really counts! This is a clean, practical design that provides for a lot of storage as well as plenty of room for a big TV! Starting to clad the outside and shelving areas with pallet wood. 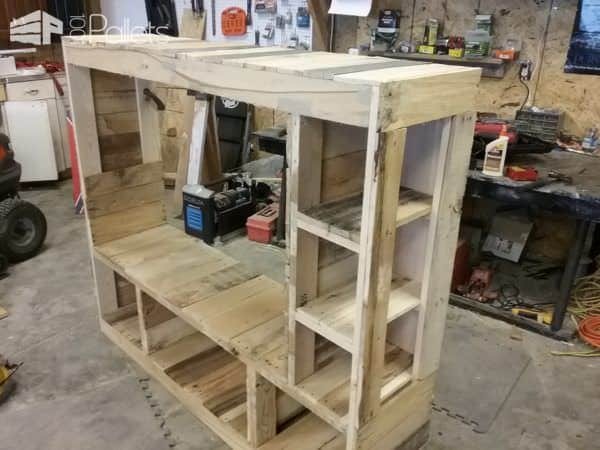 The shelves and floors are all filled in with pallet wood. I used more to make small doors. 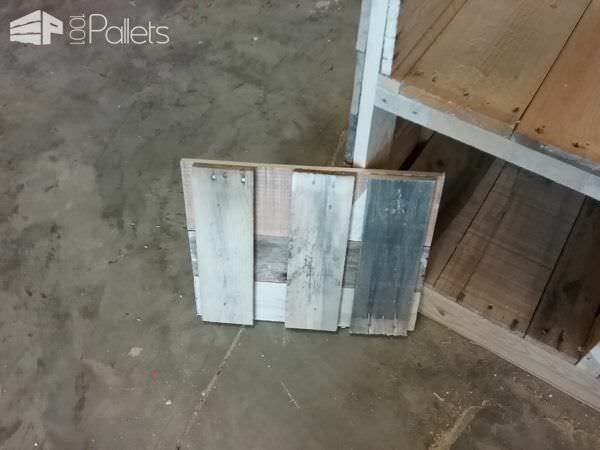 The simple door - just use more pallet wood to create a basic frame. After an application of stain. Putting my creation to good use. 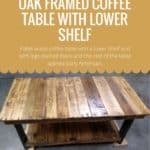 Now you need a sturdy Pallet Coffee Table to put your feet up on! How about this Magic Carpet Sofa! Western Twist Pallet Wine Rack with a Country Flair!